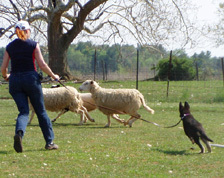 Herding can be an incredibly exciting and challenging experience for you and your dog. Few activities can compare with the sheer thrill of watching your Shiloh "turn on" their herding instincts and witnessing the pure happiness they express as they discover the job they were born to do! Proper training will enable you both to develop exceptional teamwork and establish a very unique bond - building a true sense of partnership. 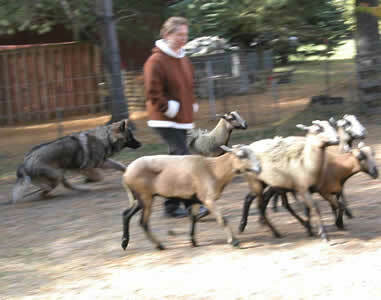 Participation in herding events help to preserve the heritage of the Shiloh Shepherd. 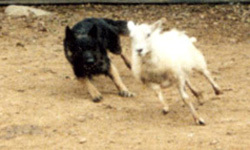 Performing in the herding arena clearly demonstrates the Shiloh's ability to accomplish the useful functions for which the shepherd was originally bred. It provides the perfect opportunity to prove our breeding programs are maintaining valuable working instincts. There are many admiral traits that go a long way toward making the Shiloh Shepherd an outstanding companion - soundness of body and character... confidence and courage... intelligence and sensitivity. These very same qualities are strongly responsible for their "biddable" nature which leads them to succeed on the herding field. Our dogs may earn titles through the Stockdog Trials offered by the Austrailian Shepherd Dog Club of America [website] under a specialized Service Member pre-registration. This is a popular organization within the herding community and their events are well attended. Additionaly, the Shiloh Shepherd was officially accepted (2004) by the American Herding Breed Association [view here] and as a result may earn titles in all AHBA entry level trials. The American Herding Breed Association offers a preliminary test for Herding Instinct. This is the ideal starting point for someone without previous experience with herding breeds. The majority of dogs participating in the HIT have never had any exposure to livestock. The main objective is to determine whether your Shiloh Shepherd has the desired instincts and is a good prospect for training. The AHBA judge is considered an expert in this field and is more than qualified to handle and to properly evaluate your Shiloh. The judge does not expect to witness a working dog who has been polished with professional training, but rather the promising traits of "diamond in the rough"! The ISSDC is committed to serving it's members, and will continually strive to open up new opportunities in herding, as this promises a brighter future for the Shiloh Shepherd breed. The ISSDC is committed to serving it's members, and will continually strive to open up new opportunities in herding, as this promises a brighter future for the Shiloh Shepherd breed. A new organization has been formed in Ontario Canada, the Rare Breed Performance Club of Ontario. 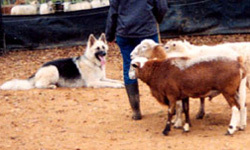 The RBPCO offers Herding Instinct Certificates to qualifying dogs. In addition, the links below offer training and herding events. We hope you'll find one in your area! For those of you who don't reside in the Tri-State area, please check out the following links to find which trainer is closest to you. For those of you in Canada and surrounding regions.